Most New Year’s resolutions are meant to improve some aspect of life. Here at Domtar, we’re making resolutions to improve our manufacturing operations. Two of our pulp and paper mills are actively working to reduce wood fiber loss and increase efficiency in 2019. During the last half of 2018, our Nekoosa and Ashdown mills began to identify the causes of, and take action to reduce, the amount of good wood fiber lost to the sewer each day instead of being used for making paper — which is almost literally the equivalent of money going down the drain. Beyond the immediate costs of lost production, wood fiber loss causes additional issues at a mill’s effluent treatment plant, where the mill has to spend even more time and money to process the additional fiber and produce wastewater treatment residual that is provided to local farmers as a soil amendment. “Because the residual is now high in wood fiber, it’s not good for agricultural use, so we have to add additional nutrients to keep our farm customers happy,” Ulrich says. To address these concerns, the mill has initiated a continuous improvement project to reduce the losses. The team’s first step is to find out exactly where along the paper-making process the fiber is being lost. If there’s a silver lining in this situation for the Nekoosa team, it’s that they aren’t the first to face it. In fact, their colleagues at the Ashdown Mill are handling similar challenges with wood fiber loss, which present opportunities for collaboration and better practice sharing. 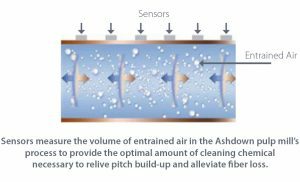 Steve Smith, Ashdown’s operations and customer service manager, says their team is making progress on alleviating wood fiber loss on the A1 fluff pulp machine. The amount of pitch, a tacky substance made of wood resins and chemical carryover, increases during the winter months due to higher sap levels in the wood. That means more sand gets into the A1 machine cleaner system, which can cause leaks and wood fiber loss. 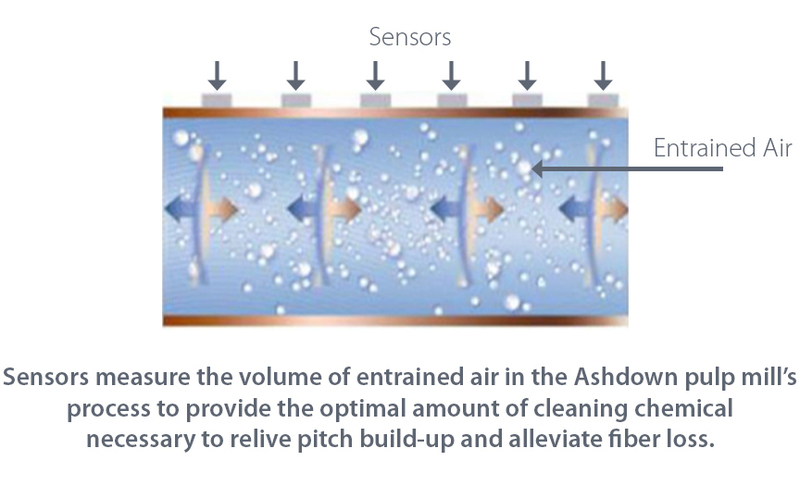 Ashdown Mill reduced pitch buildup by installing an instrument that measures the volume of entrained air and helps control the amount of chemical cleaning required. As a result, the mill has already seen a reduction in wood fiber loss. Smith says they expect the reductions will continue when they start up the thick-stock screens recently installed on the front of the A1 machine. These screens will filter out even more sand and help extend the life of fiber-cleaning components. “We expect to see more improvements with the thick-stock screens, which is something we learned about from our colleagues at the Plymouth Mill, who installed these screens on their NC5 fluff pulp machine,” Smith says. Charlie Floyd, Domtar’s vice-president of manufacturing optimization, says these projects exemplify the spirit and intent of continuous improvement. Is there any point in recycling?